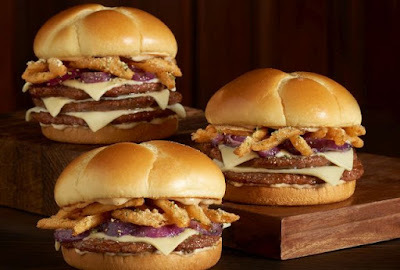 The new burger features creamy bistro sauce, parmesan-dusted crispy onion strings, grilled red onions, and a choice of one-to-three beef patties and a corresponding number of Swiss cheese slices on a toasted sweet brioche bun. The sister chains also add the new Apple Pie Loaded Milkshake and Apple Pie Stacker. The Apple Pie Loaded Milkshake takes vanilla soft serve and mixes it up with layers of caramel and chunks of apple pie rolled in cinnamon sugar before topping it with whipped cream and a maraschino cherry. The Apple Pie Stacker consists of the same soft serve, caramel, and apple pie but is less blended and more layered.